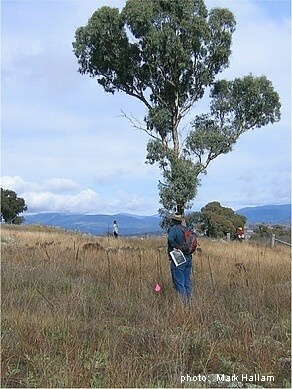 Congratulations to those who chose to be outdoors on a perfect Autumn day counting kangaroos! I reckon our ages ranged from seven to seventy and our backgrounds were just as diverse. There’s no danger of our suffering from Nature Deficit Disorder (NDD) as we worked our way through a variety of habitats, touched plants and made footsteps on soil and vegetation in every stage of life. There was no time this Mayday to reflect on why the Pinnacle Nature Reserve means so much to us but those reasons surrounded us as we walked through the reserve. The air’s freshness, endless sky, bird movements and calls, greenery’s textures, trees rejuvenated by the good seasons and, ever-inspirational, the stunning Brindabella ranges as backdrop to our endeavours. The morning’s clear skies gave way to whispy overhead clouds and cumulus on the horizon … massive edifices of vapour ever-changing in form, colour and brightness. NDD is increasingly common amongst all whose lifestyles separate them from the sense of wonder and curiosity that might normally drive them to retain contact with nature and the basic elements of the outdoors and local wildlife. Even with our singular purpose of sighting and recording Eastern Grey Kangaroos we absorbed the sights of, the sounds and senses from ‘the bush’. The difficult terrain enhanced our exercise routines, we couldn’t afford to be isolated from other people, our brains were constantly solving problems of movement, balance, navigation and we were calculating, listening and communicating. We were individual, yet vital members of a team spread out over the width of the reserve. We were volunteers engaged in useful ‘citizen science’ and guided by personable, expert members of the Parks and Conservation Service. The Stringybark forest offered quality to our exercise as there were lichened boulders to negotiate, uneven ground and leaf-litter to constantly alter our walking style. As we sought parallel routes between the trees, muscles were brought into use and senses challenged. There wasn’t time to examine it but the dry, dead-looking leaf-litter positively teems with recyclers. The energies and feeding habits of the ground-layer organisms are far more intricate and essential than we can ever comprehend without a few glimpses at explorations like David Attenborough’s Life in the Undergrowth. We’re taught to be paranoid about the leafy debris, the potential for bark and twigs to burn, and yet the ancient composting system close to the soil gives moisture and nutrients for germination to the many eucalypt seedlings we saw and keeps the depth of the litter in balance. Larvae, which are part of the composting process may emerge as moths and other insects or feed the birds we enjoy watching or studying in and around the forest. Insectivorous birds, in turn, keep invertebrate numbers in balance, trees are healthier and, in the applied-situation, fewer pesticides are needed on farms or in gardens. There were fresh soil-scrapes made by rabbits to be seen and some young shrubs had been gnawed. Some of us passed through rabbit warrens where orange and green tapes fluttered on the light breeze … signs of the rabbit-control processes that need to be maintained so plants’ seedlings can grow to their full potential in the Pinnacle’s habitats. When weeding the other day we came across the small rosettes of the Greenhood orchids we ‘discovered’ in April last year. At least rabbits didn’t find their bulbs or tubers. What plant-roots are rabbits searching for as they scrape away at the soil? Could we have rabbit scats analysed for content? Cassinia bushes have finished flowering, losing thousands of petal-like bracts as we move between them. Bursaria, with chestnut-brown seed capsules were even more noticeable and impenetrable. The Urn heath has begun its cooler-months-flowering with pale-yellow heather-like blooms. Guinea flower has bolder yellow, occasional flowers. There are tight, light-cream buds on the low Cryptandra bushes and the Common everlasting’s yellow flowers look more like wattle pom-poms from a distance than daisies. There are still a few bluebells in flower opening and turning their blooms to meet the sun each day. Showing itself to be different from the infamous weedy thistles the Native hawkweed has emerged as a new species for me this year. A few are still in bloom, their yellow flowers looking deceptively-thistle-like. As our walking progressed we realised that areas where the grasses were flattened were places the ‘roos use as ‘camps’ during the day. Their faeces were evident too, the dark, freshest ones attended by flies. Possibly the newest scats have moisture and proteins to benefit the flies. It’s possible we see older rabbit and ‘roo scats around for ages because they’re so fibrous they have no value to other animals and won’t rot down until dampness and micro-organisms and fungi digest the indigestible. John Feehan, our local dung-beetle expert, once explained that the main reason dung beetles from other continents were tested and brought here to work on cattle-dung was that there was so much residual protein in cow-pats that fly-populations exploded once cattle were introduced into Australian ecosystems. Fewer flies here in our summers shows the success of the biological control when diligently monitored. Once clear of the forest the exceptional growth of introduced grasses ensured that we quickly adapted our walking-style to cope with the often-knee-high, rank tussocks. Some species’ dry flower-heads have grown taller than people. Though kangaroo-tracks made passage easier, stepping high, being alert for hidden rocks or depressions called-in extra muscle-groups. Most native grass species have finer leaves than these descendents of past pasture-improvement policies. By April the native Weeping grass emerges beside or through other grasses and appears widespread. It’s certainly taking advantage of the drying-debris of scythed and slashed Saffron thistles and sheltering between the prickly stalks as it grows. Nearly all the ‘roo counters will have passed at least one of the grass experiment enclosures. The wire-mesh fenced exclusion zones are evidence of the experimental plots. 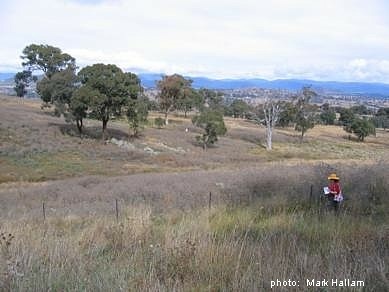 The website has details of the experiment which is seeking ways to improve the competitiveness of native grasses in the reserve by testing several treatment methods to reduce the incidence of invasive pasture-improvement grasses from the grazing-days. In moving east through the reserve we effectively pressured the kangaroos to also move east. But eventually mob-by-mob they doubled back, west, through the ranks of the well-spaced counters to be tallied. This meant we all saw the apparently-effortless efficiency of the bounding animals as they passed by. Magical! There were many juveniles and several instances of mutual examination as huge males took stock of their positions and leadership procedures. Thank you to all the FOTPINs, their families, friends, colleagues and network-members who gave time to our studies of The Pinnacle Reserve. The key to land management and habitat restoration lies, firstly, in knowing more about the resident wildlife. The data you’ve collected, the observations you’ve made have enhanced our knowledge. 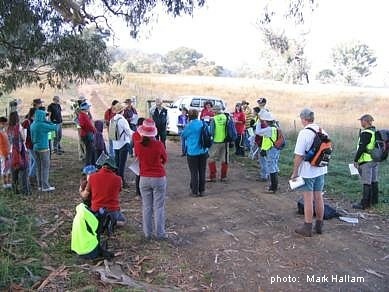 Let’s hope the reserve and events like this Mayday’s continue to enhance your well-being and enjoyment of nature.